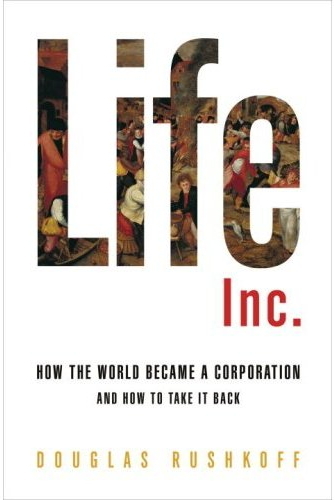 Life Inc.: How the World Became a Corporation and How to Take It Back starts with a telling anecdote: the author, Douglas Rushkoff got mugged on Christmas Eve in from of his Brooklyn apartment, and instead of getting sympathy, he was basically urged to shut up by local residents, afraid as they were that the incident would damage the reputation of their neighborhood, i.e. reduce the value of their home. “When faced with a local mugging, the community of Park Slope first thought to protect its brand instead of its people,” Rushkoff writes. The anecdote is Rushkoff’s starting point to analyze how, since the Renaissance, “the market and its logic have insinuated themselves into every area of our lives.” He argues that they mediate every single aspect of our existence, disconnecting us from everything that surrounds us. The book is quite expectedly somewhat controversial — yet may also be one of the most inspiring recent books for entrepreneurs and innovative marketers. An inspiring book for entrepreneurs and … marketers: The book is phenomenally well documented and provides fantastic insights into some of the roots of the current financial debacle. The way the story is recounted is fascinating — even if you may have questions about the angle taken by Rushkoff. One can argue that while it may be true that local trade using local currencies did foster more interactions between people and a thriving economy between the eleventh and thirteenth century, and that “real people did the best when prosperity was a bottom-up approach,” the idea that the corporatist economy initiated by the Renaissance also initiated a downward spiral that all subsequent innovations only enhanced feels somewhat simplistic at times — along with the assumption that mankind has somehow strayed from a better stage to a worse one. After all, the fact that Paris Hilton is a highly successful brand today does not mean that she would have been more than that in the Antiquity or Medieval times. In the end, the evaluation of what connected/disconnectedness may depend on the frame of reference. Plato/Socrates fought the Sophists’s ability to brand anything as a result of their disconnectedness from the essential, the realm of Forms and Ideas.